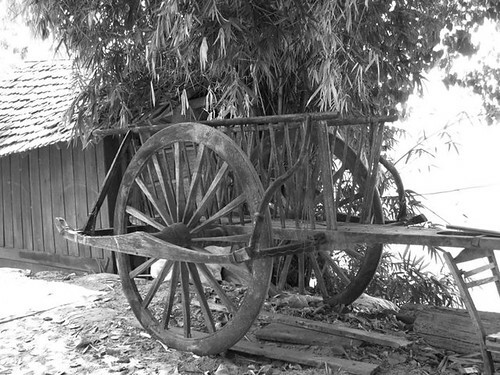 Ox carts used to be the major mode of transportation in SE Asia. They are still used widely in rural areas but even a few years ago, I saw them in small cities in Thailand. Well, not on the main roads but in the streets near the rice fields. They are disappearing now. With the development of the two-wheeled tractor, people can use it both to plow fields and, but changing the wheels from tractor treads to truck wheels, they have multi-purpose transportation. A few months ago, when the price of gas was so high, many people returned to using water buffalo to plow their fields and ox to pull carts. I wonder whether this trend will continue. Many people are buying the carts and the cart wheels to use for decoration - in front of restaurants or in their gardens. This is my contribution to Monochrome Monday. It would be a shame if they disappeared - the skill of making them will go too. They are lovely and friendly for ecology. In a selfish world these are very eco friendly but must be hard world. Lovely image. the wheel is turning full circle?! We see old wagons as landscaping here in Israel too, but these days it's very rare to see one actually in use. A shame actually, they were lovely to see. Interesting article as for me. It would be great to read a bit more about that topic. Thanks for posting this material.